Archaeologists have deduced at various times over the past century that there were several types of horses in use in Northern Britain in Roman times. 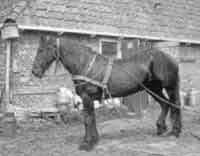 Excavations on the site of the Roman fort at Newstead, near Melrose (J C Ewart, 1911), yielded a Shetland type under 11 hands; a larger 12 hand Celtic type, probably the wild pony of northern England; a 12 to 13 hand pony with slender bones; a thickset, long backed "lowland" animal; and an Arab type of about 14 hands, possibly the imported horse type used by Spanish, French or Hungarian troops. There was also a "coarse" 15 hand animal that was, again, probably imported from the Continent (Edwards), possibly from Frisia where the Romans recruited auxiliary troops, and where there were merchant traders whose ships could carry horses. Mules, which are a donkey x horse hybrid and do not breed, were also in use. We don't know much about these animals. Although various pony authorities suggest that the native stock were dark-coated, we don't actually know what colour they were. Stone sculptures and bronze toys give no indications of colour. Collected bone evidence from Southern England mainly points to small ponies in domestic use from the late Iron Age through to early medieval times. "they display in battle the speed of horse (cavalry), [together with] the firmness of infantry; and by daily practice and exercise attain to such expertness that they are accustomed, even on a declining and steep place, to check their horses at full speed, and manage and turn them in an instant and run along the pole, and stand on the yoke, and thence betake themselves with the greatest celerity to their chariots again." A common misconception is to link the Fell, Friesian and other mainly-black breeds (eg, Merens/Ariegeois, Døle, Pottok, Asturcon, Garrano and Bardigiano) by their modern appearance alone - ie, black colour and length of hair - and to imply that the Friesian is the only foreign input the Fell breed has had. The issue is by no means so clear-cut. Many areas other than Frisia contributed auxiliaries to the Roman Army in the North of England; such as France, Belgium, Spain, Hungary and Germany; for more details see the Cavalry page. Some of these countries practised gelding, so male war horses would not necessarily have been breeding material. A Fell should not be described as a mini version of any other breed. In particular, the use of the term "mini-Friesian" is frowned upon by enthusiasts of the Fell pony and the Friesian alike. Both Fells and Friesians have changed physically. (see Type page for a fuller discussion of the Fell's conformation). The Friesian of today is more upheaded and showy than even its recent predecessors. Its preferred modern shape is taller and lighter than its earlier recorded type. "During the 16th and 17th centuries, but probably also earlier, Arabian blood was introduced, especially through Andalusian horses from Spain. This has given them the high knee-action, the small head and the craning neck." (Bouma, 1979). Whatever breeds were used, this crossing introduced desirable lighter riding qualities into what had previously been more of a heavy-armour or work horse. For a timeline please see the Friesian Horse Association's web site where you can also read a short history from G. J. A. Bouma's “Het Friese Paard” from which the above quotation is taken. Both the Fell and the Friesian originally varied much more in colour than they do now. The Friesian was not always an entirely black breed. Once, roans were permitted, and up to the end of the 19th century about twenty percent were chestnut or bay; these colours were deliberately eliminated (or blacks were "carefully selected", depending on your point of view). 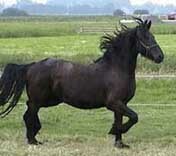 It is the modern Friesian that has become almost exclusively "a black horse". Fells have always been described as brown, bay, black or grey, but other colours have been registered in the early days of the Stud Book though they are not now seen in registered stock. It may be more significant for our equine argument that that the colour black is easily bred "pure" to exclude other colours if fashion so dictates. Brown Fells, for instance, dropped steadily out of favour on the show circuit from the 1950s onward, and even now many fewer browns/bays are registered than blacks. 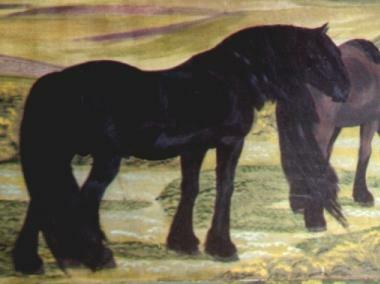 The result is that the modern (and mistaken) concept of the Fell, even in England, even in sometimes Cumbria, is "a black pony". 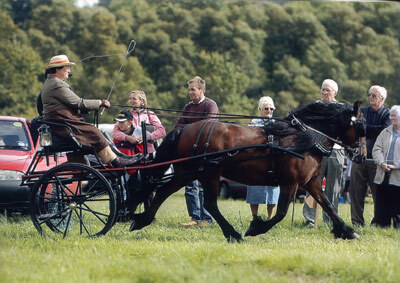 Yet I have ridden or driven more bay and brown Fells (see photo of my excellent driving mare) than blacks! Richardson (1990) remarks on the prepotence of the Friesian horse, while Dent and Machin-Goodall (1962) give evidence of the similarities of the Frisian language with Old English which is supported by DNA testing of people in more recent times (albeit from the southeast Danelaw area rather than from northwest England). However, there is no particular reason to suppose that ancient Roman horse imports - even if they were large, which we don't know - could still have even a minor influence on the modern Fell after 2,000 years. Surprisingly little is known of Roman military sources of horses (Hyland), so, until the conservators of the Vindolanda tablets decipher a Roman military stud list, we can only deduce the types of horses in the Fell’s homeland from the bones recorded in archaeological digs. Remember that the modern idea of a "breed" was a concept unknown in ancient times, and that what we're really talking about is a type of animal from a particular location. We may safely assume that there were some horses from Frisia among the Roman army lines because there were some Frisian auxiliaries employed; but we must not forget that there were thousands of foreign troops in Britain, including 1,000 French cavalry based at Stanwix, Carlisle. We actually know nothing specific about whether there were any breeding programmes, any long-sustained crosses, what types might have been involved or what locations they came from, the numbers that were bred, how many crossbred horses might have been kept as breeding or working stock, or how many offspring survived to produce further generations. 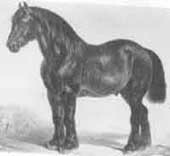 It is equally possible that there were dark coated ponies all over Britain and Western Europe from which several rather similarly dark modern breeds descend, such as the Merens/Ariegeois, Døle, Pottok, Asturcon, Garrano and Bardigiano as well as the Fell and Dale. Probably the original stock from which Fell ponies descend were in Britain long before the Romans came. Archaeological views (pers comm 2009) are that equids existed in the area that was later to be Britain, around 300,000-400,000 BP at places like Boxgrove and Hoxne. They were also around during the late Palaeolithic. However, at some time while Britain was still connected to the Continent of Europe, they became extinct or possibly migrated south because of adverse climatic conditions. The modern view is that all British ponies descend from domestic stock, re-imported to the island by people, possibly during the Bronze Age, possibly later. I am indebted to Dr Marsha Levine and Dr Andrew Millard who have commented on this matter by email (2009). Who is to say that all these "black breeds" don't just originate from a similar, very ancient stem? One would not be the "ancestor" of any of the others - they would all be descendants from one ancient stock. In that case, one has to assume that the Roman Army's auxilia, and their military preferences, must either have had little or no effect on any of the contemporary types, or must have affected all of them to roughly the same extent. I personally doubt that the Friesian is the fons et origo of these breeds. More likely they (including the Friesian) all derive from a common root; but it is a "chicken and egg" argument that could keep zooarchaeologists, DNA researchers and horse enthusiasts happily arguing for many years to come. As an example: According to Jansen & Thomas's mitochondrial DNA study of 652 horse mtDNA sequences, the Fell is most closely related to another ancient British breed, the Exmoor pony (Jansen, Thomas et al. (2002) Proc. Natl. Acad. Sci. USA 99, 10905-10910). Shown diagrammatically, the Exmoor is close to the point of origin of all breeds, "the root of the network according to equid outgroups," and it occupies a branch of its own - separate from a dozen or so other branches. From the Exmoor's position in the diagram, one branch leads to the Fell, and others lead to the Fjord, the modern Thoroughbred, and the Rhineland Draft horse. An even simpler theory about that the large number of black coated ponies is that they are a modern result of selective breeding within a registered stock. This is undeniably the case with the modern Friesian and probably so with the Shetland too. The temptation, however, in relation to the background of the Fell pony, is that "the Romans" make good modern advertising copy, whereas the more complicated alternative possibilities do not. It is too easy to offer a "black, and no white" nugget of "Roman history" that offers a theory to support the despised but commercially useful phrase, "mini Friesian", rather than to try and give a more balanced view with all the confusing shades of grey that this involves. To the untutored eye, some present day Fells can appear superficially similar to some present day Friesians. But I have even been asked if a black Shetland was a Fell pony! The same can happen with other stocky breeds. Simply observing that an equine has a black coat and a long mane is not sufficient evidence to make the leap to asserting causality way back in history. "The Fell Pony Society wishes to state that it strongly disapproves of the use of comparisons with other breeds to describe, promote or advertise the Fell. A Fell pony is a Fell pony, a strong, hardy, versatile, purebred English working pony, who should not be described as a mini version of any other breed." So please, don't do it! An occasional modern likeness cannot prove, on its own, that any two breeds looked the same in Roman times, nor that they were interbred. In fact, history is silent on the subject.